Fletcher and I went to Baptist Hospital this morning for his renal ultrasound. Things went well and we were able to go up to the PICU and visit our friends there. It's always great to visit and NOT have stay there! :) I got a call from TCC this afternoon and the US showed no blockages or stones of any kind. It did show that his kidneys are enlarged for his size and age. What this means I'm not sure. They are making an appointment for Fletcher with the nephrologist over at Children's Hospital, hopefully he can give some direction on what to do with our little guy. That's all I know for now. Thanks for your prayers! Well, I'm very glad that there were no stones as I have heard that those are extremely painful. Good luck with the follow up and keep us posted. Fingers crossed he rests well for the next couple of days. He's had a rough time. First of all, I am so glad that Fletcher seems to be doing better. I have been thinking and praying for him and your family. 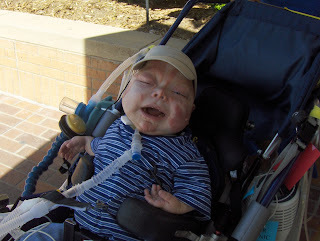 I still have not gotten the pleasure of meeting that sweet little boy. I hope to soon. Stephanie has offered to take me up to TCC sometime, and I need to take her up on that. Also, thanks for the comment on my blog. Names are definitely powerful. I once did a study on people in the Bible and their names and how they lived up to them. It was amazing to see how God predetermined who they were and the names they were given were like a prophecy into their future. I knew then that when it came time for me to name my child that I would not take that lightly. Fletcher definitely lives up to his name and I know that God gave us the name Ransom because he has big plans for our little man. Just checking in and wow, great news about no stones. I'll continue to pray for your little angel. Any new news? This is Tuesday and I know the medical community does not move as fast as we'd like, but what now?